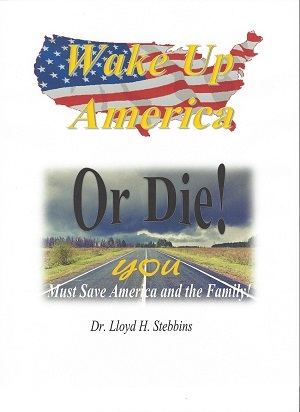 My new book, Wake Up America–or Die! YOU Must Save America and the Family, is 100% complete. It has been reviewed by a professional team of reviewers and their comments and recommendations incorporated. The book is currently awaiting publication. The book comprehensively explores the development of the rapidly accelerating collapse of the American culture and the family. Fully two thirds of the book projects an awesome and viable remedy. Although there are a number of other well-written books that explore the current crisis, they all fall far short of providing a workable solution. Abundant founders’ quotes—the founders of the United States were endowed with uncommon wisdom. Today, it seems to be open season on the founders. Frequent quotes allow them to speak for themselves. Abundant scriptural quotes—the broad Judeo-Christian audience is supported with as many Old Testament quotes as New Testament ones. Famous scientists’ quotes—Well-known scientists “speak” about their faith in God. Contemporary American culture is largely driven by evolution-rooted humanism. Evolution blows away like a house of cards in a hurricane upon only cursory inspection. Bunker busters like radical feminism, multiculturalism, and political correctness have a surface appeal, but devastating underlying goals. Government exists or should exist to provide security and protect God-given freedoms—that’s all. The Judeo-Christian worldview inspires constitutionally-limited small government; the evolution-rooted humanist worldview incites limitless big government. Real freedom has not been a natural condition since the Garden of Eden. Since freedom is unnatural in a fallen world, it must be soul-deep and passionately protected or it will absolutely be lost to tyranny. The pubic educational system has become intellectually inefficient, as well as emotionally and spiritually toxic. Churches/synagogues must promote home schooling and establish a vast number of affordable faith-based schools using existing buildings that sit empty most of the week. Love is spiritual energy. All love comes from God just as all physical energy comes from the sun. As a glass prism breaks up sunlight into a rainbow of colors, the prism of man separates God’s love into a rainbow of services and attitudes toward others, including humility, forgiveness, mercy, longsuffering, and a servant’s spirit. Maturity is possible only to the extent than an individual grows in each of these aspects of love, all of which depend on a network of relationships with others. Solo maturity is not possible. No culture has ever survived the breakdown of the family. Being a homemaker is a career; it is the most important career in the universe. The cohesiveness of families and the sustainability of the American culture exist only to the extent that women fully appreciate the awesome power of the homemaker and become excited about choosing that career path. For most people, a committed lifelong marriage provides the richest possible human experience. For a few people, a deliberately-chosen, goal-directed single life may be preferred. Children raised by strangers will not become adults with a fully embedded array of Judeo-Christian values. Most church/synagogue leaders consider a ministry to be blessed if it increases in numbers and offerings, but that view does not measure the condition of human souls. A holistic worldview deeply affects all areas of life, including the influences of science, art, and music. The Judeo-Christian view of these areas may not be what you think. Dr. Stebbins has devoted his professional career to working in the iron and steel industry, water and wastewater treatment, a long period in environmental consulting, rising to positions such as Regional Vice President of Operations and Corporate Vice President of Industrial Marketing. During the most recent 15 years he has been teaching university-level courses. South Jersey Regional Director for a saturation evangelism campaign, themed “I Found It.” It was piloted in Atlanta with a number of churches, lead by Charles Stanley’s church and later expanded nationwide. Dr. Stebbins had the pleasure of coordinating 70-80 churches. Participated in hundreds of Campus Crusade sponsored Bible study group meetings, most frequently formatted as prayer breakfasts or luncheon events. Participated on teams organized to support two of the organization’s evangelistic movies. Lay Witness Missions (Non-denominational ministry: A team of excited turned-on Christian witnesses visit a designated church for a weekend-long series of activities for the sole purpose of leading people to a personal relationship with Jesus Christ. Note that his activities for these national organizations was always as an enthusiastic volunteer who merely loves the Lord. He has not been a paid employee of any of the organizations. Of course, his most profound Christian experience was caring for his late wife 24/7 for seven years, while she endured the debilitating effects of a neurodegenerative condition similar to Alzheimer’s disease. It was a monumentally life-changing experience. Despite the obvious tragedy, the stories of God’s infinite grace during the time abound. The range of interview topics is a broad as the list of speaking topics found at the Speaking page on this blog site. Tell us about your 15-year personal journey when personal, professional, and spiritual interests dovetailed toward the writing of this book? What is your vision for the book? What is your specific goal for the book? Why are your concerns and message expressed with a sense of urgency? What is the underlying theme of the book? How does a worldview drive individuals, families, and a nation? What are the roots of the undeniable crisis? How did we get here from there? Why is the traditional family so vital to America’s culture? Specifically, what can people in the audience do to participate in the awesome remedy? Thanks for the tip. The plug-in seems to be designed for WordPress.org. My blog is on WordPress.com for now.